After ranking the teams by WPER, I found the following rankings for each of the past four NBA regular seasons. The rankings here are pretty compelling. First off, the teams that have made the finals each of the past three years appear in the top eight of the rankings. 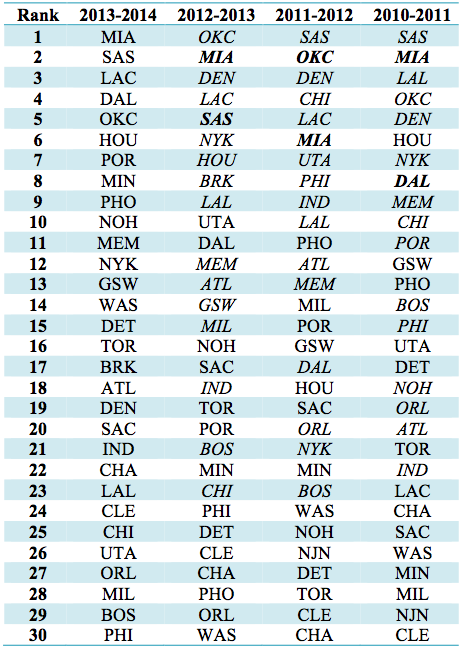 Moving down the table gives a good approximation of where each team stood in the NBA hierarchy. However, we also see a few flaws in the table. Specifically, there’s a systematic overvaluing of offensive performance, and an undervaluing of defensive performance. This is probably most obviously seen in the Indiana Pacers, who rank 18th last year and 21st this year, and in the Denver Nuggets, who rank 3rd in 2011-2012 and 2012-2013. The bias is explained by the formula for PER – defensive performance is only factored into the PER through steals and blocks, which aren’t an accurate picture of a player’s defensive ability since they reward high-risk plays that often break a team’s defensive discipline. The previous table gives a measure of confidence in the WPER statistic. In the 2011-2012 season, the Thunder and Heat made the NBA Finals, and the next season, they posted the top two WPERs. That season, Russell Westbrook was injured in the playoffs, clearing the path for the Spurs to win the West and play the Heat in a 7-game Finals. This year, the Spurs and Heat are the top teams in WPER. Although the anecdotal evidence is supportive of the model, we decided to see just how correlated WPER is to team performance. We did a regression against the most tried-and-true metric of all – win percentage. This graph shows all team records over the past four years, and the associated WPER. The R2 of 71% is fairly strong, and suggests that WPER accounts for 71% of the variation in the win percentage. Based on those results, we’d feel fairly comfortable using the WPER statistic to predict NBA playoff performance, along with a little bit of manual adjustment to account for the overemphasis on offensive play. The model predicts that the top two teams in the NBA are the Heat and Spurs – last year’s Finals contenders. A rematch of that epic seven-game series would present Tim Duncan with the chance to win his fifth ring and cement his legacy as one of the greatest players of all time, and would give LeBron James an opportunity to complete a three-peat. All that being said, it would be an exciting matchup, and it’s what I’m predicting here. Although not hugely controversial, based on the model, I’m picking the Heat in 6, although I’ve still got hope that the Knicks, lurking at #12 in WPER and just outside the playoff picture, will make some waves! Special thanks to basketball-reference.com for the statistics used in this article. Neil Rangwani hails from suburban New Jersey, and is a sophomore studying Operations Research and Financial Engineering at Princeton. A lifelong Giants and Knicks fan, he’s developed an immunity to the ups-and-downs of life. Interesting to see the 2011 heat at the same ranking of the 2013 heat, because I think most would agree that the 2013 team overall was much better and much more complementary than the first iteration of the “big 3” heat. Could this be because the big 3 (all posting great PERs) played more minutes in 2011 on a less balanced team, skewing the overall quality of the team? The high r/r^2 is very interesting to me. Aqeel – all three of the Big 3 saw a reduction in playing time from 2011 to 2013, with only Wade’s being a significant change. Also as expected, James’s PER rose significantly, while the other two saw slight drops. The combined effect of those changes is that the team’s WPER actually rose by almost a full point, from 16.3 to 17.2, which is a huge change. I believe that’s due to James’s ridiculous PER of 31.6 last season, which carried the team to new heights even as Wade and Bosh lost time to less efficient role players. Nick – I actually used regular season win percentage, since there is a lot more data there on teams with low WPER and I didn’t want to exclude them from analysis. I’ll follow up after the playoffs with a playoff win percentage chart. This is an interesting approach. It has got to contribute to a basketball handicapper’s win percentage.